Love—good and bad—forces three teens’ worlds to tilt in a riveting novel from New York Times bestselling author Ellen Hopkins. Three teens, three stories—all interconnected through their parents’ family relationships. As the adults pull away, caught up in their own dilemmas, the lives of the teens begin to tilt…. Love, in all its forms, has crucial consequences in this standalone novel. Ellen has a knack for writing beautiful poetry. There is even meaning behind how she forms her stanzas. For these quotes, I did not follow that format as it proved too tricky for me to do so on blogger. However, I feel that these quotes are powerful even in paragraph form. Coyotes hunt in packs, and so do assholes. I can't speak for God she said. But I have thought long and hard about this. Shelby has given us a glimpse of human perfection, because inside that flawed body is a spirit untouched by greed or artifice or hatred. Shelby is the essence of love. For some reason, that reminds me of this author who came to our school. He talked about how every word an author writes causes ripples, like tossing a stone into a pond. And how you don't know where they'll go, or who they'll touch, or when they might come back to you. I think everything you do is kind of like that, too. Ellen Hopkins has a knack for writing extremely vivid and realistic stories. In each story line, we see teenagers struggle with their identities, families, and personal lives. Mikayla is definitely my favorite of the three while Shane's and Harley's stories are a close second and third - they kept going back and forth for me. One of my favorite aspects of how Ellen formatted these poems is at the end of each segment, she gives us a peak into the mind of different characters affected by the actions of our main three. My favorite ones came from Shelby, Shane's four year old sister. Shelby does not have the ability to talk, but the thoughts she had were so innocent and beautiful that I wished for more from her. Each character is distinct with his or her own clear voice and personality. Mikayla is head over heels in love with her boyfriend, Dylan, and thinks her parents are too controlling and "mean." However, once she learns of her pregnancy, and finally comes clean, there is a huge turn around in her attitude. She becomes an adult much too early, but I admire her for her decisions and her gumption to stick to what she believes. I found myself feeling more pity for Shane than our girls. His sister is incredibly sick with in incurable disease and needs constant care. She cannot talk, eats through feeding tubes, and is essentially living on borrowed time. His parents are distant with his mom focused on Shelby and his dad caught up in his work and is usually drunk or passed out from drinking. He finds solace in weed and eventually his boyfriend, Alex. Things go from bad to worse when Shelby dies and I just want to scream at his parents to pay attention to the downward spiral Shane is in. Harley just needs to be put in a big protective bubble. After meeting her soon-to-be stepbrother, Harley drastically changes herself. She loses weight, starts wearing tight clothing and makeup, and becomes a person who wants nothing more than to please whatever boy is currently paying attention to her. While I feel bad for Shane, I ache for Harley. She wants to grow up so fast and have a boyfriend that she compromises herself and her values. Like I mentioned within the quotes, even the way Ellen formats some of her poems have meaning. There's a structure behind them that means something other than to avoid conformity of poems. Some poems even have poems within them, particularity those that come from someone other than the main three. These stories are so real, so vivid, than I can picture them happening to anybody across the world - and I imagine that they have played out in some form. 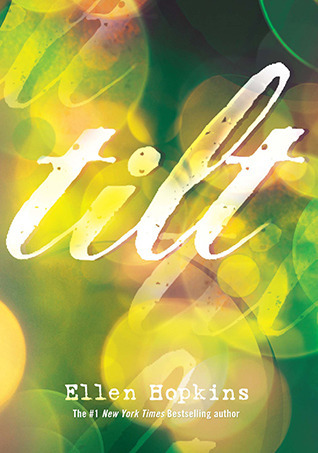 After finishing Tilt, I found out that it is a companion novel to Triangles. It's obvious that something is going on with the parents and I was curious to find out what, though I did have my suspicions, and I'm thrilled that I have the opportunity to see these stories from the perspectives of the moms.